As long as the decisive struggle for control of the Philippines was being fought on Luzon, the islands to the south were safe from invasion. At no time during the first four months of the war did General Homma have sufficient troops to conduct operations simultaneously in both areas. Having established a foothold on Mindanao, at Davao, late in December, he had been forced to limit operations in the south to air and naval reconnaissance. It was not until April, as the Bataan campaign was drawing to a close, that Homma had a large enough force to embark on the conquest of the southern islands. The opening gun of this campaign sounded on 10 April, one day after the Bataan campaign ended. Between Mindanao and Luzon lie the islands of the Visayan group, the most important of which are Cebu, Panay, Negros, Leyte, and Samar. Most of these islands consist of a central mountain area surrounded by coastal plains. Panay, split north and south by a comparatively large central plain between two mountain ranges, has the largest level area of the group. Cebu, the most mountainous, has the least. The road net throughout the Visayas is generally the same: a primary coastal road all or part way around each island, with auxiliary roads linking important points in the interior to the ports along the coast. None of these roads, in 1941, had more than two lanes, and most were poorly surfaced and winding. On the most highly developed of the islands-Cebu, Negros, and Panay-there were short stretches of railroad. 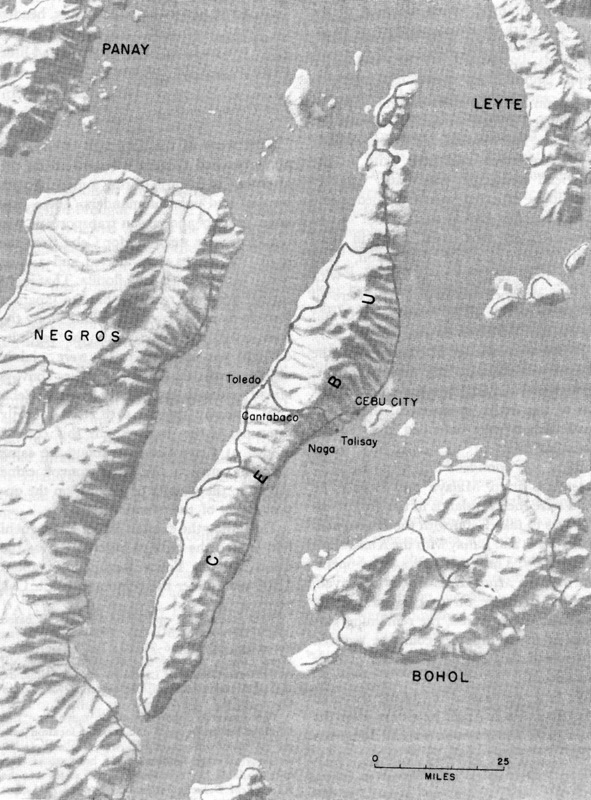 Coastal shipping supplemented the road and rail system in the islands and linked the islands of the Visayan group with each other and with Mindanao. 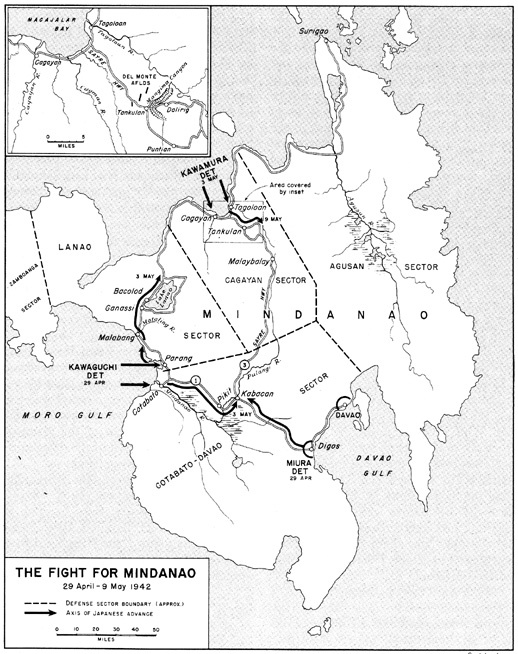 The defense of Mindanao and the Visayas- comprising a land area half again as large as Luzon-rested with the Visayan- Mindanao Force, commanded by Brig. Gen. William F. Sharp, who had his headquarters initially on Cebu. This force was composed almost entirely of Philippine Army troops. Of the five divisions mobilized, in the south, only three, the 61st, 81st, and 101st, remained in the area. The other two divisions, the 71st and 91st, moved to Luzon, leaving behind their last mobilized regiments, the 73d and 93d. In addition, a large number of provisional units and some Constabulary units were formed on the outbreak of the war. MAJ. GEN. WILLIAM F. SHARP AND HIS STAFF, 1942. 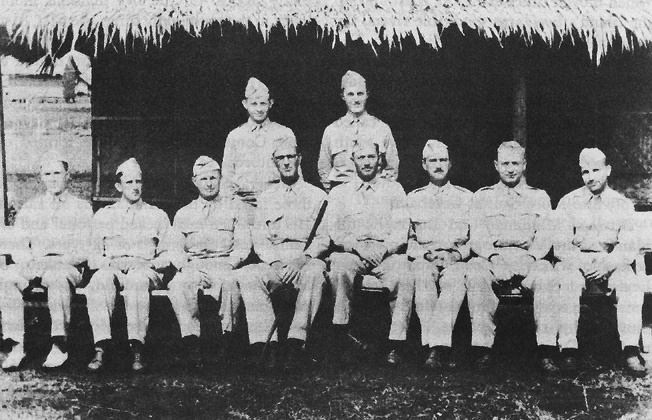 Back row, standing left to right: Maj. Paul D. Phillips (ADC) and Capt. W. F. O'Brien (ADC). Front row, sitting left to right: Lt. Col. W. S. Robinson (G-3), Lt. Col. Robert D. Johnston (G-4), Col. John W. Thompson ( C of S ) , General Sharp (CG), Col. Archibald M. Mixson ( D C o f S ) , Lt. Col. Howard R. Perry, Jr. (G-1), Lt. Col. Charles I. Humber (G-2), and Maj. Max Weil (Hq Comdt and PM). The organization of the Visayan-Mindanao Force established early in January lasted only about one month. On 4 February, in an effort to facilitate the delivery of supplies expected shortly from Australia, USAFFE assumed direct control of the garrisons on Panay and Mindoro, both a part of General Sharp's command. A month later, a week before MacArthur's departure for Australia, the remaining Visayan garrisons were separated from General Sharp's command which was then redesignated the Mindanao Force. The five garrisons in the Visayas were then organized into the Visayan Force and placed under Brig. Gen. Bradford G. Chynoweth, who had commanded on Panay. 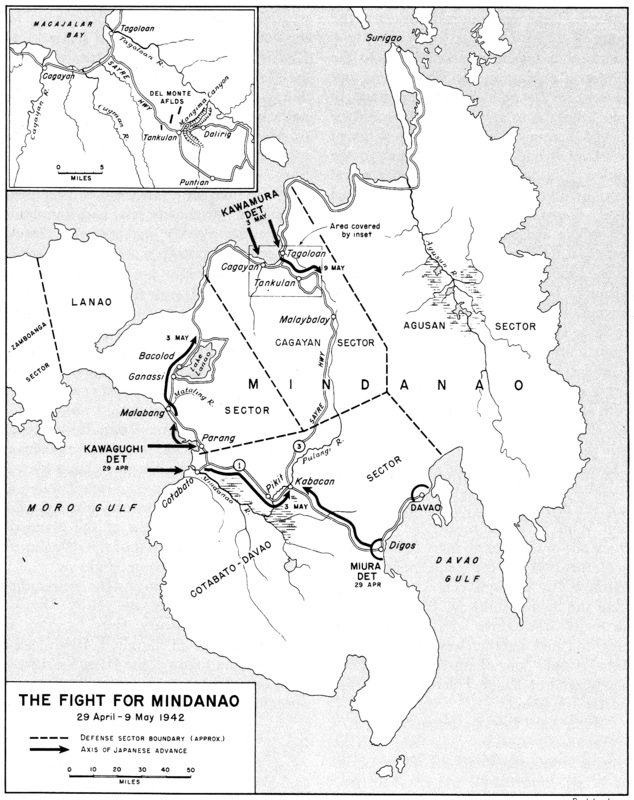 As coequal commanders, Sharp and Chynoweth reported directly to higher headquarters on Corregidor.7 This separation of the Visayan-Mindanao Force clearly reflected MacArthur's desire to insure the most effective defense of Mindanao, which he hoped to use as a base for his promised return to the Philippines. Perhaps the most interesting feature of the preparations for the defense of the Visayas was the program known as Operation Baus Au, Visayan for "Get it Back." Initiated by General Chynoweth during his tenure as the commander of the Panay garrison and then adopted on Cebu, Operation Baus Au was the large-scale movement of goods, supplies, and weapons into the interior for use later in guerrilla warfare. Secret caches were established in remote and inaccessible places, and at mountain hideouts which could be reached only by steep, narrow trails barely passable for a man on foot. At Cantabaco, midway across the island, the highway split in two. One branch turned northeast to pass close to Camp X, where General Chynoweth had his headquarters, then southeast to Talisay. The southern branch led into Naga. At both places there was a defending force of Filipinos whose route of withdrawal depended upon the security of Cantabaco. Should the Japanese pursuing the 3d Battalion, 82d Infantry, gain control of that town, the defenders would be cut off. spected these demolitions himself and felt sure that if the enemy had passed Cantabaco, the charges would have been set off. But at 0330, when the sounds of battle became louder, Chynoweth's confidence began to wane. The enemy was undoubtedly nearing Camp X. A half hour later all doubts vanished when large groups of Filipinos, the outposts of Camp X, appeared in camp. They seemed hypnotized, fired in the air, and refused to obey commands in their haste to flee. After a brief conference with his staff, Chynoweth decided to pull back to an alternate command post on a ridge a half mile to the north and await developments there. The collapse of the Cantabaco position had been the result of an unfortunate and unforeseen combination of events. The demolition teams in which Chynoweth had placed so much faith had waited too long and when the enemy appeared, led by tanks or armored cars, they had fled. Like his commander, Colonel Grimes believed that the enemy would be halted by blown bridges and obstacles along the road. Not hearing the sound of explosions, he, too, concluded that the Japanese were still at a safe distance. In his confidence he drove forward to familiarize himself with the terrain and was captured by an enemy patrol. Deprived of their commander, his men "stayed quite well hidden. "17 So well were they hidden that even the Japanese were unaware of their presence. The reserve battalion had never even started south. The messengers sent to that battalion failed to return, and if the battalion commander did receive Chynoweth's order to move to Cantabaco, he never complied with it. Instead, the battalion moved farther north, well out of reach of the enemy. The enemy landing came at dawn, 16 April, and was made by the Kawamura Detachment of 4,160 men. The bulk of General Kawamura's troops came ashore at Iloilo, at the southeast corner of Panay, and a smaller force landed at Capiz to the north. Two days later a third landing was made at San Jose, along the southwest coast.20 None of the landings was opposed. By 20 April General Kawamura had occupied the strategic points of the island, and so far as he was concerned the campaign was over. For Colonel Christie, safe in his well-stocked mountain retreat, the campaign had just begun. Wild game was plentiful; he had ample fresh water, 500 head of cattle, 15,000 bags of rice, hundreds of cases of canned goods, and an adequate supply of fuel. Machine shops had been constructed in the mountains, and when his supply of rice gave out there was a mill to thresh more. Almost immediately he began to send his men out on hit-and-run raids. These so aroused the Japanese that they organized a punitive expedition at San Jose to capture Christie and destroy his headquarters. A Filipino agent sent warning of the Japanese plans and an ambush was prepared by a company of men armed only with bows and arrows, spears and bolos. Hidden along the sides of the pass leading to Christie's hideout, the Filipinos with their primitive weapons took the Japanese completely by surprise, killed many, and sent the rest posthaste back to San Jose. But the successes of guerrilla warfare could not disguise the fact that, with the principal towns and road net in their hands, the Japanese controlled the island. 33d Infantry, plus miscellaneous troops, had remained on Mindanao.21 Time and again Colonel Miura had attempted to extend his control into the interior but without success. Indeed, had he not had air and artillery support and had his men not been equipped with automatic weapons, it is doubtful if he could have remained on the island. The greatest drawback to the training program was the shortage of ammunition. The supply was so limited that its expenditure on the firing range was prohibited. Instead, the men spent long hours in simulated fire, with doubtful results. "A few rounds fired by the soldier," observed Colonel Tarkington, "would have demonstrated to him the capability of his weapon, acquainted him with its recoil, and paid dividends in steadier marksmanship. "24 Most of the men who fought on Mindanao never fired a live round before they went into battle. Early on the morning of 29 April, the emperor's birthday, the Kawaguchi Detachment began to land at Cotabato and Parang, midway up the west coast of Mindanao.27 The seizure of both towns was vital to Kawaguchi's plan. From Cotabato he could advance inland to the Sayre Highway by way of Route 1 or in small boats by way of the Mindanao River. From Parang he could send his men north toward Lake Lanao and the north coast of the island, or southeast to join the rest of the detachment heading toward the Sayre Highway. The men of the Kawaguchi Detachment encountered little resistance getting ashore at Cotabato, where the demolition teams had already completed their work. Their advance through the town, however, proved more difficult. There they were opposed by the 2d Battalion, 104th Infantry, which put up a stubborn resistance until enemy aircraft, presumably from Zamboanga, entered the fight. The battalion then pulled back to a previously prepared position on the outskirts of Cotabato where it prepared for an extended stand.28 Events beyond its control made this impossible. There was little action during the day. Colonel Nelson, the sector commander, received reports on the progress of the two Japanese columns but was most concerned about the troops sailing up the river. There was nothing to prevent this force from disembarking along the river bank and moving up one or more of the numerous trails to Route 1 to establish a roadblock behind Nelson's retreating men. Before the day was over, Nelson was receiving reports of just such movements, as well as the presence of Japanese troops in Pikit, where the Mindanao River crossed Route 1 at a point only about eight miles from the Sayre Highway. The Digos force had been under pressure since the middle of April. Led by Lt. Col. Reed Graves, this force consisted of the 101st Field Artillery (PA), less one battalion, and the 2d Battalion, 102d Infantry (PA). By the 28th of the month, after a particularly heavy attack, it was clear to Colonel Graves that the Japanese on his front were about to make a major effort. The next morning, simultaneously with the landing of the Kawaguchi Detachment at Cotabato, Colonel Miura began his advance westward toward the Sayre Highway, supported by low-flying aircraft from Davao. Graves's troops opposed the Japanese advance stubbornly, and effectively broke up the initial assault with mortar fire. Graves's brave stand proved a fruitless gesture, for two hours later, at 1900 of the 2d, he was ordered to withdraw immediately toward the Sayre Highway. The order came from the commander of the Cotabato-Davao Sector, Brig. Gen. Joseph P. Vachon, who had sent a small force to Kabacan to delay the Japanese approaching from the west. The Digos force would have to make good its escape while there was still time. Further resistance, no matter how successful, would only increase the peril to Colonel Graves and his men. That night they began to evacuate the position they had held so stubbornly since 28 April. Next day, with the 2d Battalion, 102d Infantry, acting as rear guard, the Digos force began to march toward Kabacan and the Sayre Highway. rected Colonel Graves and the troops of the Carmen Ferry Subsector to hold the Sayre Highway. The Kawaguchi Detachment successfully fought its way to Kabacan, but arrived too late to close the trap on the Digos force. All Kawaguchi's efforts to clear the Sayre Highway and make his way northward failed. Vachon's troops held firm until the end of the campaign a week later. Those of General Kawaguchi's men who came ashore at Parang on the morning of 29 April met an entirely different reception from that which greeted the men landing at Cotabato. Here they were met at the beaches by the regulars of the 2d Infantry, 1st Division (PA).30 Under the leadership of Col. Calixto Duque, the Filipinos had established strong defensive positions on the beach and when the first hostile landing parties made their appearance at 0400 of the 29th they ran into heavy and effective fire from machine guns. For more than six hours, until 1100, the 2d Infantry held its ground. Finally, in danger of being outflanked by a Japanese force that had landed a short distance to the south, the regiment fell back to a previously prepared position about two miles inland.31 After sending a small detachment southward to establish contact with the force landing at Cotabato, Kawaguchi's men moved into the town. By late afternoon they had established contact with the southern force and were in firm possession of Parang. Their next objective was the coastal town of Malabang, twenty-two miles to the northwest. Rather than march his men along the twenty-two mile stretch of Route 1 which separated Parang and Malabang, General Kawaguchi apparently decided to utilize the transports which had brought them to Mindanao. Leaving a small detachment to guard the town, he sent his troops back to the ships late on the night of the 29th and set sail for Malabang. At about 0300 of the 30th, at a point a few miles south of the objective, the Japanese began to land.32 A half hour later Company K, 61st Infantry, reported that enemy light tanks had passed its position. The Japanese attacked Colonel Mitchell's new position at 0730 the next day, 1 May. Again they struck at the flank of the Filipino line and at 1030 Mitchell was forced to order a second withdrawal. This time he fell back five miles. In the confusion one company was cut off, but Colonel Mitchell was compensated for this loss by the addition of two companies of the 1st Battalion of the 84th Provisional Infantry Regiment, which joined him when he reached his new position. Later in the day the 120 survivors of the battalion which had withdrawn from the Mataling line along a back trail straggled into camp, and with this force Colonel Mitchell began to prepare for the next attack. His orders from the sector commander, Brig. Gen. Guy O. Fort, were to hold his position at all cost. The Japanese, who had lost contact with the retreating Filipinos during the morning, reached the new line at about 1300. While their infantry prepared for the attack, they kept the Filipinos pinned down with artillery, mortar, and machine gun fire. At dusk, the volume of Japanese fire increased and, shortly after, the infantry moved out in a full-scale attack. Within a short time they had overrun Colonel Mitchell's defenses and were threatening his command post. By 2300, when the Japanese called off the attack, the defending force had practically disappeared. Rounding up all the men he could find, altogether about thirty, Mitchell made his way to the rear. At about 0230 he encountered a detachment of sixty men from the 81st Division (PA) on the road and began to establish a holding position. The men had just set to work when they were struck by a Japanese motorized column which scattered the tired and dispirited men. Colonel Mitchell's luck had run out. Twice he had escaped the Japanese, but this time he was captured. With the rout of the 61st Infantry and the capture of its commander, the Japanese gained control of all of Route 1 as far north as Lake Lanao. The Japanese who had reached Ganassi early on the morning of 2 May had halted to await the arrival of the rest of the force which moved up during the day. Early the next morning the entire force, with light tanks in the lead, advanced north along Route 1. By 0800 the tanks had reached the destroyed bridge in front of the 73d Infantry line and halted. One tank sought to cross the shallow stream but was hit by a shell from the 2.95-inch mountain gun and knocked out. The others made no further effort to cross. With Route 1 blocked, the rest of the Japanese column came to an abrupt halt and the troops poured out of the trucks. Before they could deploy and take cover, they were hit by withering fire from the far side of the stream, "which made up in its concentration at point-blank range what it lacked in accuracy. "33 The toll on the Japanese side was heavy. Despite this first setback the men of the Kawaguchi Detachment continued to press forward. Soon they had the support of artillery and a single plane, which alternately attacked and observed the 73d Infantry position. Unable to make any headway by frontal assault, the Japanese sought to turn the enemy's flanks. Their efforts proved successful before the morning was out and shortly after noon Colonel Vesey gave the order to withdraw. signed to the Mindanao operation, the Kawamura Detachment, had begun to land along the shore of Macajalar Bay. ment under Maj. Paul D. Phillips, armed with three 2.95-inch guns, all that remained of the artillery in the Mindanao Force. Farther to the rear were the 62d and 93d Infantry (PA). Sharp ordered all three units to move up to the line. Pending the arrival of the two regiments, Phillips' detachment was to take up a position behind a deep crater on the Sayre Highway and block any Japanese attempt to advance south. When it was joined later in the day by the 62d and 93d Infantry Sharp would have a strong line, supported by artillery, in the path of the Japanese. To General Sharp "events seemed to be moving satisfactorily. "35 Although the enemy controlled the beaches and the northern terminus of the Sayre Highway, his own troops had disengaged without loss and were in position along a secondary line of defense. Already part of his reserves were blocking the highway and other troops were moving up to their support. So optimistic was the general that he set his staff to work on a plan to counterattack north along the highway next morning. panies of the 43d Infantry from force reserve. The Puntian Sector would be held by the 61st Field Artillery and the 93d Infantry. Colonel Morse would command the troops in Dalirig; Col. William F. Dalton, those before Puntian. The 103d Infantry, cut off by the Japanese advance was made a separate force and assigned the mission of defending the Cagayan River valley. The withdrawal was completed on the morning of 4 May when all units reached their designated positions. The remainder of that day as well as the next, during which time the Japanese limited themselves to aerial reconnaissance and bombardment, was spent in organizing the line. In the Dalirig Sector, Lt. Col. Alien Thayer's 62d Infantry, closely supported by the 2.95-inch gun detachment, occupied the main line of resistance along the east wall of Mangima Canyon. Companies C and E, 43d Infantry (PS), Colonel Morse's reserve, were stationed in Dalirig, and in a draw 500 yards behind the town were the 200 men of the 81st Field Artillery, which had had a strength of 1,000 when the Japanese landed. Colonel Dalton, with two regiments, used the lull in battle similarly to dig in before Puntian. Undeterred by Colonel Dalton's gains in front of Puntian, General Kawamura continued to press his advantage in the north. At about 1130 of the 9th, as the 62d Infantry began to withdraw through Dalirig, his men entered the town from three sides and struck the retreating Filipinos. Already disorganized, the troops of the 62d Infantry scattered in all directions. The two Scout companies in the town, under the leadership of Maj. Alien L. Peck, made a brave stand but finally withdrew just before their positions were encircled. Whatever consolation General Sharp derived from the fact that the Puntian force was still intact was tempered by the bitter realization that the Mangima line had been breached and the bulk of his force destroyed. "North front in full retreat," he radioed General MacArthur. "Enemy comes through right flank. Nothing further can be done. May sign off any time now. "36 Except for the resistance of scattered units, the Japanese campaign in Mindanao was over.